GTmetrix Bookmarklet – Start a Test from your Bookmarks Bar! Quickly start a GTmetrix test on any page using our convenient bookmarklet. 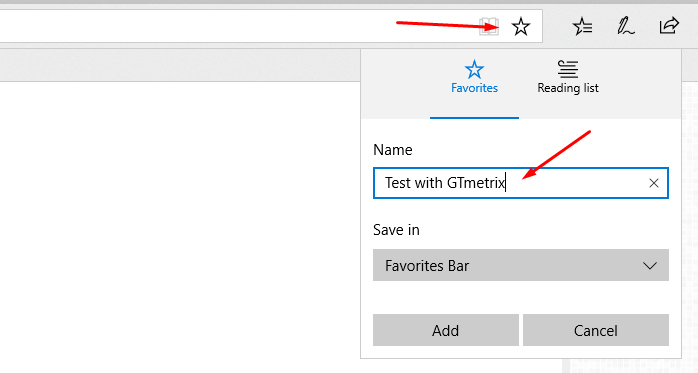 Start GTmetrix tests with one-click from your bookmarks bar! Read on for instructions on how to set it up. 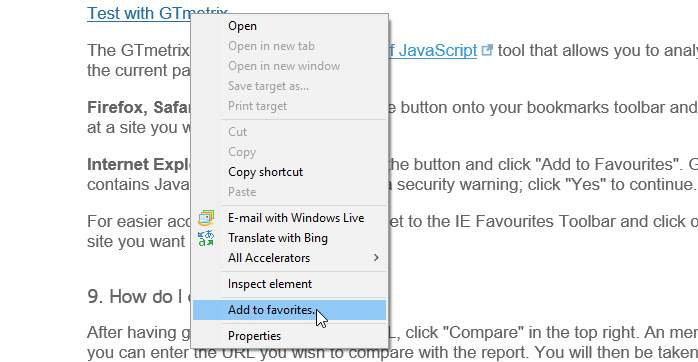 Here’s how to set up the GTmetrix bookmarklet in a variety of browsers. Drag the above text link into your bookmarks bar. When you’re on a site you want to analyze, just click on it! A new tab will be created with a GTmetrix test started. Unfortunately, Microsoft Edge doesn’t provide a simple way to add bookmarklets to the Favorites bar, but here’s a workaround. First, make sure your Favorites Bar is enabled. Enable the Favorites bar in Settings. Then, favorite this page by clicking on the star button in the address bar. Rename the favorite to “Test with GTmetrix” and be sure to Save in the “Favorites Bar”. Right-click on “Test with GTmetrix” and click Copy link. Then right-click on the “Test with GTmetrix” favorite you created earlier, and click “Edit URL.” Paste the URL you copied from the above link, and press Enter on your keyboard. Right-click on the Favorite, click “Edit URL”, and paste the bookmarklet URL. Hit Enter on your keyboard when complete. Click on the bookmarklet when you’re on a site you want to analyze. Right click on “Test with GTmetrix” and click Add to favorites. Move your bookmarklet to the IE Favorites Toolbar and click on it when you’re on a site you want to analyze.